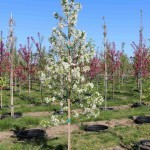 An upright, pyramidal tree with green foliage and white flowers. 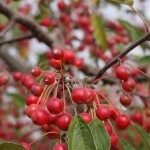 The abundant, glossy, bright red fruit is very persistent, lasting well into winter. The disease resistance is good to excellent. Grows best in full sun in a moist, well-drained soil. The form lends itself for use as a small street tree.